Master Taíno has been active in the Leather community for a quarter century. He has a Leather Family of twelve members and a household with one live-in slave. He is the owner of slave paul since 2010. He founded MTTA, Inc., a non-profit educational organization on Master/slave relationships. He has presented workshops around the country since 2001 and has been a keynote speaker at Black Beat, the Leather History Conference and Behind Closed Doors. 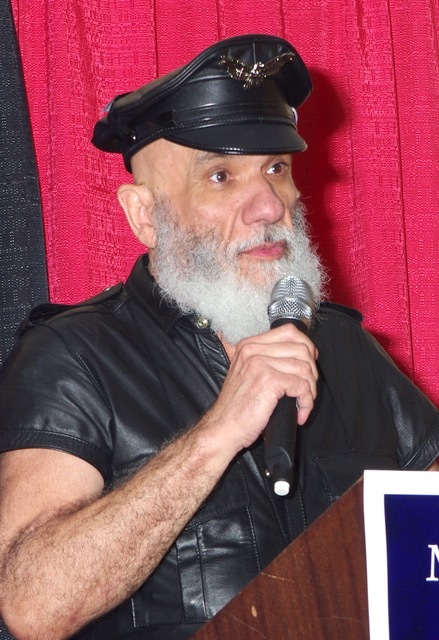 He has been honored with the Vi Johnson Award at Black Beat 2012, the Pantheon of Leather’s “Man of the Year 2011 Award”, the “Master Steve Golden Paintbrush Award 2011” at the Southwest Leather Conference, the “Jack Stice Memorial Award 2010” at South Plains Leather Fest, the “Black Rose Vaughn Keith National Educator Award” in October 2009, among many others. He is a member of Defenders Leather Levi Club since 1993 and served as President for three years (2002-2005) and he is an Associate member of ONYX Mid-Atlantic since 2013. He also founded MAsT Washington in 1999, one of the oldest chapters. Master Taíno has a very comprehensive website: www.mastertaino.com.